Home Fashion Hollywood Interview Movies Pickings Exclusive Interview with Usher Morgan about his upcoming film "Pickings"
Exclusive Interview with Usher Morgan about his upcoming film "Pickings"
We had an exclusive interviewed with Usher Morgan, Usher Morgan is an award-winning filmmaker whose work include "Good Kids", "Prego", "Fine Dining", "Trapped Inside" and the upcoming feature film, "Pickings". Morgan's first narrative film was a comedy short film entitled Prego, which was written with the help of Seinfeld writer Andy Cowan. It won the Best Comedy Short Award at the 2015 Manhattan Film Festival, Best Comedy Short Award at the 2015 Chain NYC Film Festival, 2 awards from the 2015 Indie Fest Film Festival, and the Best Comedy award at the 2015 Trinity International Film Festival. Prego amassed a cult following online, reaching over 800,000 views on YouTube since its release in December of 2015. Morgan's first feature film, Pickings was filmed in New York City in 2016 and will be released to select theaters via AMC Independent and Dark Passage Films on March 2nd, 2018. A student of Dov Simens and a self-proclaimed cinephile, Morgan's directing style is influenced primarily by film-noir and spaghetti westerns. His favorite filmmakers are Wes Anderson, Quentin Tarantino, Sergio Leone, Delmer Daves, Howard Hawks and Alfred Hitchcock. 1. What made you want to became a film director? I've always loved movies, ever since I was a kid. So I always knew that I'd end up working in the film industry in some capacity. It was after I finished my first screenplay that I knew that I had to be in charge of the final product, so producing and directing was the next logical step. 2. Tell us about Pickings? The film follows the story of Jo Lee Haywood - a single mother and neighborhood bar owner who spent years trying to escape her violent past. But when a local mobster and his gang of thugs come knocking on her door, Jo is forced to embrace her inner demons and confront her deadly history in order to protect her family and property. It was shot under a $350,000 budget in the New York City area and features Elyse Price, Joel Bernard, Katie Vincent (who also served as the film's associate producer and music supervisor), Joe Trombino, Emil Ferzola, Yaron Urbas, Michael Gentile, Christopher Liam Gentry, and Samantha Zaino, among others. 3. Any links to social media you'd like to share? 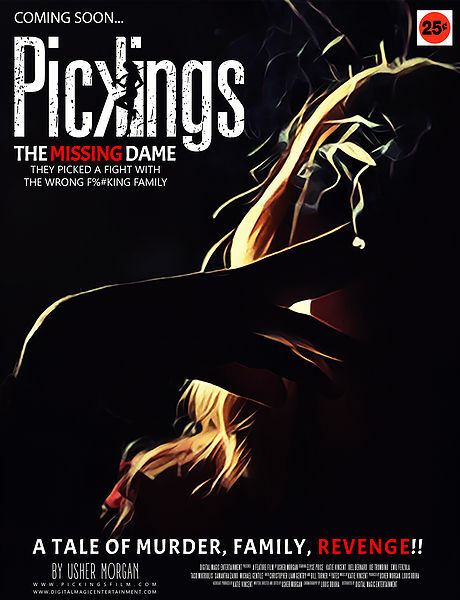 You can follow Pickings online @ www.Facebook.com/Pickings and check out the newly released trailer on www.PickingsFilm.com the film will be released to theaters in March, 2018 via Dark Passage Films. Will it be feature on Netflix? Wow, I will buy this when its out. I watch pickings and I bet you my life has never been the same. Here is the list of Upcoming Hollywood Movies 2018 release dates for India .These movies are the ones to watch out for. This list is subject to changes as it depends on censor certification and producers. At times the release dates of various upcoming hollywood movies may get postponed due to various reasons. Below is the Hollywood Movies 2018 ,calendar once that is over you can find the updated list for 2019 also.